This contemporary duo is multi-talented and offers a high-energy performance that will impress your guests. 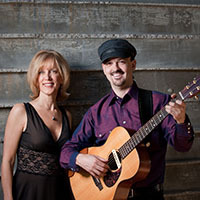 While both performers offer amazing vocals, he plays guitar, ukulele, and harmonica, and she plays guitar, and percussion. They are the perfect addition to any private party, reception, special event or grand opening.